Because it's absolutely necessary and required by law that James Franco have at least one finger in every single pie at all times, he's getting his own line of T-shirts through 7 For All Mankind. 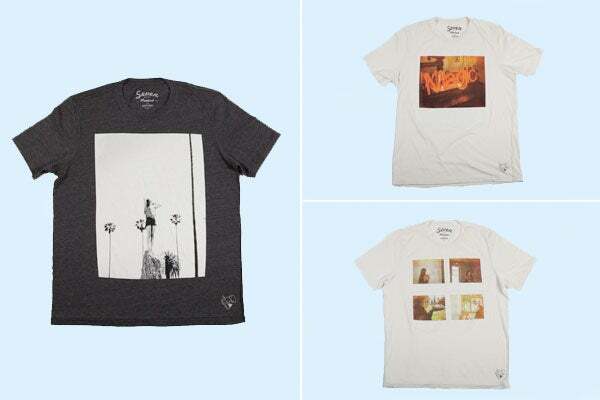 Its pretty much standard photo-print T-shirts, which is to say they're not bad but not exactly mind-blowing, either. After the worst commercial ever, anything James Franco does will look amazing by comparison. Hipsters will enjoy these, and we might even buy one if there's extra cash laying around. Maybe we can sell them big on eBay someday...they do have his signature on them, after all! So, overall, good job, James, we guess? Maybe we're giving him a hard time. Would you throw down $89 for one of these babies? They're still a heck of a lot cheaper than your normal Alex Wang fare (although we don't deny owning a few of those). The collection will launch in stores and online on September 6, just in time for Fashion's Night Out. Photo: Courtesy of 7 For All Mankind.